These templates can be used to plan all of your even numbered lessons within the LLI Blue System especially for those teachers who prefer to type in their lessons and save onto a file. They follow the structure of the lessons presented in the LLI Blue System Lesson Guide. 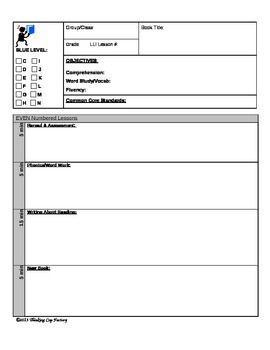 Using these templates, the teacher is also able to write objectives and also align the Common Core Standard(s) the lesson addresses.